Home » Quilting » Ready, set, jelly roll race!!!!!! Ready, set, jelly roll race!!!!!! Hey everyone! How you all doing today? If you have Littlies, you could be forgiven for thinking that I’ve gone a little bit mad and been watching a bit too much Ben & Holly. But no (it’s Transformers all the way in our house at the moment! 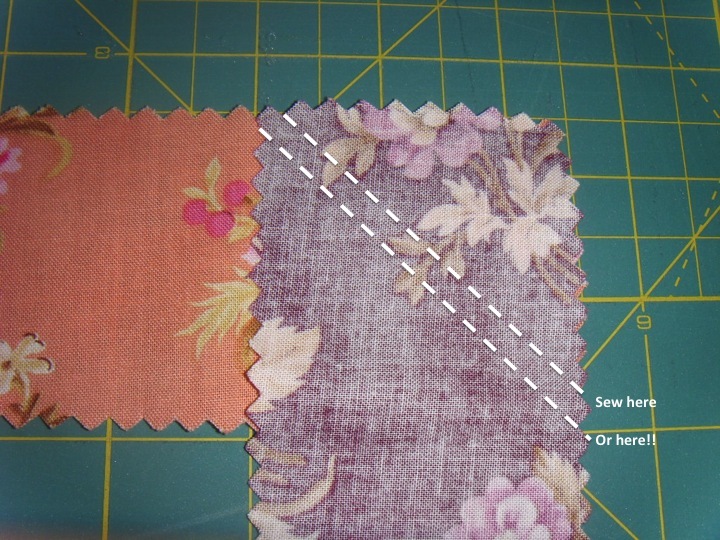 ), it’s all about making a patchwork quilt top in double quick time!!!! A few weeks ago, I came across the jelly roll quilts for the first time: take 40 jelly roll strips, sew them all together and made a patchwork quilt top in about 45mins. In America they have races and I think I read that once the strips are joined together the top can be made in 35mins!!! It’s quite phenomenal. I tried to resist but once I’d paid a visit to YouTube, I just had to try it! So I went in search of the perfect fabric and found a bundle that included 60 jelly roll strips and 60 6″ squares. Plenty to be getting on with and the colours just made my heart sing! I looked around at a few jelly roll quilts whilst I waited for my fabric to arrive. The finished quilt top should end up being somewhere around the 50″ x 60″ size, which is about 2 strips of fabric wide. I wanted to have a bit more variation so I decided to sew all the strip together and then cut each strip in half, separate them into different piles and then sew them all together again. What do you think? I’m fairly happy with it – I just love this fabric and the mix of paisleys, flowers, dots and stripes and muted colours. There’s too much pooling at the top and bottom of the quilt though – too many of the same fabrics next to each other (especially at the bottom) and lots of browns at the top and purples at the bottom. I obviously didn’t mix the strips up enough, so I think I’m going to have to undo a couple of the entire strips and reposition them otherwise it’s going to annoy me too much! I’m not going to muck around with it a lot though, just try and separate some of the matching strips. I’ll keep you updated! That first row takes f-o-r-e-v-e-r!!! It feels a bit like a marathon – you start off all keen but try and pace yourself, you start to wane a little bit in the middle section (especially when you realise there’s a lot of matching going on with your fabric strips – grrrr!) and then speed up towards the end when you realise you’re nearly at the finish line! I didn’t mix my fabrics up enough – I tried to sort them into piles where the fabrics wouldn’t overlap which obviously failed! Some people have said that they threw all the fabrics up in the air and picked them at random, which I think I might try next time! The jelly rolls leave lots of fluff over everything – vacuuming and clothes washing is necessary after a race! I don’t normally do random so this technique is quite good for coming up with a random pattern, although I’m obviously too much of a perfectionist as well based on the fact that I want to fiddle with it!!!! I do love this method though and am planning on making a few more things like this – my family might be able to expect lots of quilts over the next few Christmas’s and birthdays!!!! Today’s sky ● cloudy with rain. Again!